Call us or email us today with your applications questions and we will put the right Waterline Controls technology to work for you. With our commitment to satisfaction and our 5 Year Limited Warranty you cannot go wrong. FPT Level Control w/ High & Low Alarm. For accurate and dependable automatic level control of break tanks and holding tanks for Fire suppression purposes. The WLC series meet all the requirements for the codes in these types of installations. A cooling tower may account for 3/4 or more of the water use in a commercial building. An integral and essential part of saving resources is controlling the water levels using the right product. Our controllers are advanced, reliable and automatic and in some states the utility company offer rebates for installing them in this application because of their proven reliability. Recreational environment systems for out of the line of sight installations. Non-corrosive electronic sensors with intrinsically safe low voltage operation. Single drain, dual pump down and dual drain alternating pump systems with high level set point. Simplex and Duplex pump down systems all constructed as needed for the application. Automatically alternates between two pumps to operate them equally; thus minimizing down time. Lead-lag controller with dual pump down system or dual drain alternating pump system with high level set point. For domestic residential drinking water we offer a low cost alternative to the float switch. 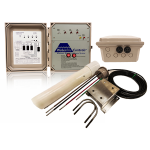 Any Waterline Controls product series will apply to the commercial potable water systems and industrial uses. Monitor water levels, operate pumps and open valves for effortless movement of water from one lake to another. High accuracy compensates for wave action and manages water levels to within 1/8” of operating range. Building Management System (BMS) connection capability ensures accurately captured information to properly manage the system. Availavble in pump up or pump down systems. Designed to provide a 15-year average duty cycle with 1% failure rate. Virtually any industry that will have to store significant volumes of water for either their production operations or various plant management systems can depend on WaterLine Controls systems.